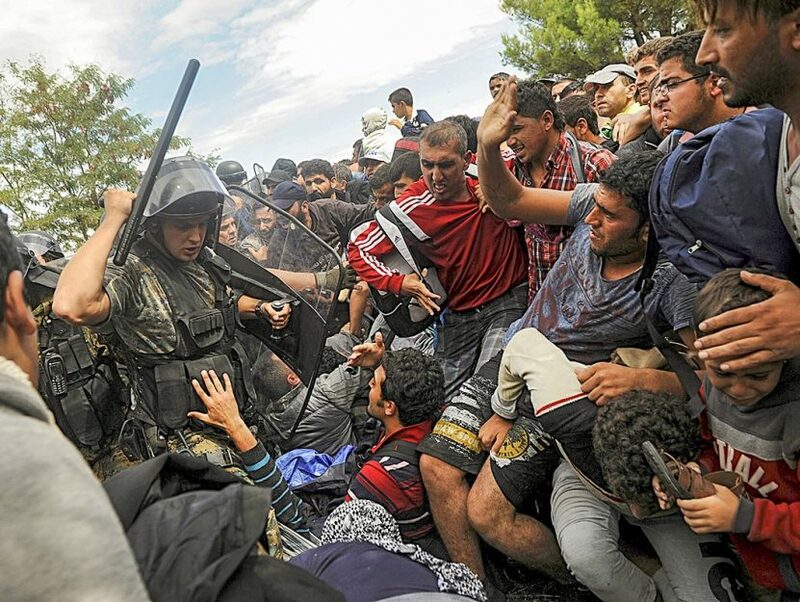 A Macedonian police officer raises his baton toward migrants. On March 18 EU leaders and Turkey finally struck their long discussed Grand Bargain. In return for becoming Europe’s buffer against distress migrants fleeing devastating conflict and hardship, President Erdogan’s increasingly authoritarian government extracted valuable political and economic booty – the prospect of visa-free travel to the EU for Turkish citizens, and €3B in additional financial support. The implications of this agreement are deeply troubling. If developments follow the plans laid out, the bargain will sanction fundamental violations of longstanding international law principles and policies. It will legitimize the refusal of protection to thousands of bona fide refugees and asylum seekers by one of the world’s richest and safest continents; it will incentivize yet lengthier, more hazardous, and more costly trafficking-mediated journeys for those desperately fleeing for their lives. It will signify a capitulation to xenophobic and nationalist sentiment in the most advanced human rights region in existence. And it will create a precedent for globalized indifference to suffering, even when that suffering is on one’s own doorstep rather than in a remote and invisible region. The historic agreement between the EU and Turkey validates the claim that a policy of humanitarian generosity and compassion is unsustainable. It endorses and formalizes the sealing of European borders as legitimate, and it perpetuates the notion that a wealthy continent of 350 million inhabitants cannot now accommodate an influx of less than 1 percent of its population, far smaller than previous mass flows in times of emergency, even when the capacity of much less wealthy and more overcrowded regions is manifestly strained. Under the terms of the deal, all refugees and migrants entering Greece by way of Turkey after March 20, 2016 will be deported back to Turkey, whether or not they have legitimate asylum claims. It is left to Turkish officials to determine eligibility for asylum among those returned. Those deemed eligible will be placed in refugee camps in Turkey, joining the ranks of the over 3 million Middle Eastern refugees already in Turkey. Those deemed ineligible will be deported back to their home countries. In exchange for this warehousing service, Europe will provide Turkey with an additional €3B of fiscal support and a pledge to resettle one Syrian refugee within Europe for each Syrian refugee returned to Turkey, capped at a maximum of 72,000. EU officials are supposed to screen arrivals individually before the return is effected; they are supposed to refrain from returning anyone who would face a risk of persecution in Turkey and they are supposed to have regard for applicable norms of international law, including the obligation not to discriminate and the obligation to ensure that the best interests of any child caught up in the removal process remain a primary consideration. The prospects of such compliance are dim at best. Given the scale of arrivals and the political pressures to evidence prompt and numerous removals, checks are likely to be perfunctory and inclined towards return. The likelihood of mass, group deportation fueled by an overwhelming political mandate supportive of exclusion and deterrence far outweighs the possibility of meticulous adherence to human rights and humanitarian principles. So much for the EU side of the bargain. The prospects of compliance on the Turkish side are at least as bleak. Turkey is a country with a checkered history of human rights violations and deep biases towards certain groups, in addition to a rapidly evolving authoritarian politics even in respect of its own citizens. It is unlikely to respect the international norm that protects the right of any person to leave a country; rather, it will turn itself into Europe’s de facto detention center. Paradoxically, the prize for preventing refugee exit will be – if the bargain is adhered to – visa-free travel (i.e., even freer exit) for Turkish citizens. Resettlement numbers from Turkey to the EU will be tiny and the pace will be very slow if current resettlement from Italy and Greece to northern Europe, promised months ago, is any indication. This agreement marks the beginning of a new, darker, phase in the Fortress Europe story. Asylum seekers arriving at the outer borders of the Union have long had to contend with onerous barriers reducing access to protection: carrier sanction policies, which turn commercial airline staff into risk-averse immigration officers keen to exclude inadequately documented passengers; safe, third-country rules which block transit from the first country of refuge to the refugee’s destination of choice; safe country of origin policies which block access to any protection for some nationalities, irrespective of personal circumstances. But this agreement signals a further deterioration in humanitarian standards. For the first time, bona fide refugees and asylum seekers can be barred from EU entry with impunity, against the remote prospect of resettlement at some unspecified future date. With razor wires springing up across increasing numbers of intra EU borders, the continent is rolling back basic humanitarian standards hard fought for in the three quarters of a century since the Holocaust in favor of closed borders, xenophobic policies, and a move away from its founding principles. Turning its back on refugees, Europe is now relying on the very country it long excluded from EU membership because of its troubling human rights record. The bargain entrusts to Turkey the lives of hundreds of thousands of vulnerable men, women, and children, many of them multiply displaced, newly destitute, and traumatized after 5 years of Syrian civil war. The refoulement of this highly vulnerable population to Turkey will exacerbate risks of forced and bonded labor, of child sale, child marriage, and child exploitation. Recent Human Rights Watch reports reveal a rampant and thriving refugee child labor market in Turkey, raising concern over the increased exploitation of children. Many civil society actors, including a multitude of NGOs on the ground in Greece, have loudly criticized the Grand Bargain. Thousands of refugees have demonstrated, evidencing outrage at European violations of their basic human rights. In Eidomeni, a Greek village near the border with Macedonia, refugees have gone on hunger strikes; on the transit island of Lesbos, refugees have threatened to drown themselves rather than face deportation out of Europe. Echoing this despair about the implications of the Grand Bargain, several experienced NGOs active in the refugee camps in Greece have decided to shut down their operations to avoid complicity in grave humanitarian violations. This dramatic and unforeseen turn of events exacerbates the already highly precarious situation in Greece, where help in managing and caring for the newly arrived 50,000-strong refugee and migrant population is desperately needed. Save the Children and UNHCR have suspended many of their activities at the Moria Camp, while the withdrawal of Medecins Sans Frontières will jeopardize the health and wellbeing of many. In brokering this deal, democratic Europe has turned its back on the moral high ground it long claimed to occupy. It has left that space to much poorer, less democratic, and more crowded countries, countries ravaged by civil war like Lebanon or besieged by repeated waves of refugee arrivals like Jordan. In so doing, Europe has weakened the EU project as a whole and acquiesced in the unraveling of the Schengen regime. It has undermined the authority of international law, privileged short-term, nativist self interest over a forward looking policy of internationalism, and handed a strategic victory to devout opponents of universal human rights, from Le Pen to Orban to ISIS. The urgency of reaffirming the imperative of access to fundamental rights protections for all across Europe has never been stronger. But the prospects of this occurring have never been weaker. Previous PostPrevious Ending Forced Labor in India: What Does It Take?